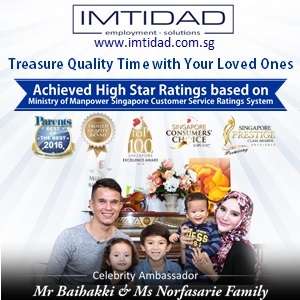 We are proud to introduce our Celebrity Ambassador Family of Mr Baihakki & Ms Norfasarie who have recently engaged a domestic helper for their loving growing family. 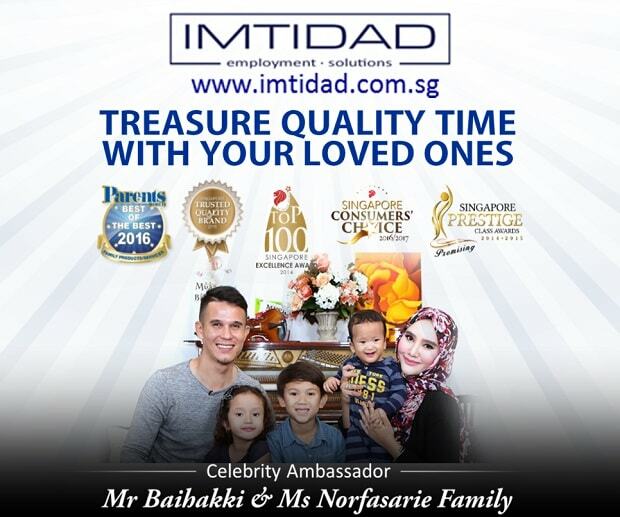 Mr Baihakki is Singapore’s well-known professional footballer, currently playing in the Malaysian League, and his wife, Ms Norfasarie owns her own spa business. Both are busy individuals and therefore, it is important for them to have a reliable and honest helper who can handle daily chores efficiently so that they can spend more time with their children when at home. At IMTIDAD, we embraced the principle of “Treasure Quality Time with Your Loved Ones” and with the current Singapore fast-paced busy working lifestyle, we truly understand the daily challenges faced by working parents in order to achieve an ideal work and family balance. Selection for an honest and reliable domestic helper for the family is a daunting task as it requires careful screening and selection. Therefore, we are committed to assist families to find the suitable helper based on client’s specific requirements. Especially, for families with newborn or growing kids who needs an extra help at home handling household chores so that parents are able to spend more quality time with their loved ones. 2) Awarded 2016/2017 Singapore Consumers’ Choice & 2015 Singapore Trusted Quality Brand. 3) Awarded 2016 Best Domestic Helper Recruitment Agency by Parents World Singapore. 4) Accredited & Recognised Partners by Top Parenting Brands such as Mummys Market, Young Parents Singapore, Asian Parent Singapore, Sassy Mama Singapore, SuperMom Singapore, Singapore Motherhood, New Age Parents, Kiasu Parents, CareerMums, Parents World Singapore, Kids World Singapore and NTUC Income. 5) View Facebook and Video Testimonials from our existing clients commending on our services. 6) FREE home or office visit from selection, interviewing and signing of contracts at client’s convenience. Visit our website at www.imtidad.com.sg to view the profiles of domestic helpers. Quote Promo Code “IMTIDADNEWAGEPARENTS” to receive $100 Off Agency Fees when arranging appointment at our office.